Tom Logan had heroically spent almost 10 minutes on the chore and had just placed the last mug in the rack when his wife Kerry intervened. Logan said: “It’s like she’d been lying in wait for me to finish loading it up so she could do it all again. “No sooner had I closed the dishwasher door than she swooped in and started taking everything out while calling me an ‘utter cretin’. “She then proceeded to slam the dirty dishes down on the work surface really loudly before putting them back in a slightly different order. ARE you a Leaver who’s finally realising no-deal Brexit could come crashing down on you if May’s deal is rejected? Here’s how to pretend everything’s fine. Cheerfully say things like “A lot of bother going on with this Brexit, eh?” as if (a) you had nothing to do with it, and (b) you’re talking about some temporary roadworks in your town. MPs and Theresa May are to blame for messing up Brexit, right? It definitely wasn’t a fundamentally bad idea with terrible planning, like building your own ‘rocket car’ from an old pram with 500 fireworks taped to the sides. Use the tried-and-tested psychological defence mechanism of denying reality, in the manner of an alcoholic who’s crashed his car again after 22 vodkas but is still just a ‘social drinker’. Keep saying stuff like “This time next year we’ll be free and doing our own trade deals!” and spend plenty of time in the parallel universe of Daily Telegraph online comments. 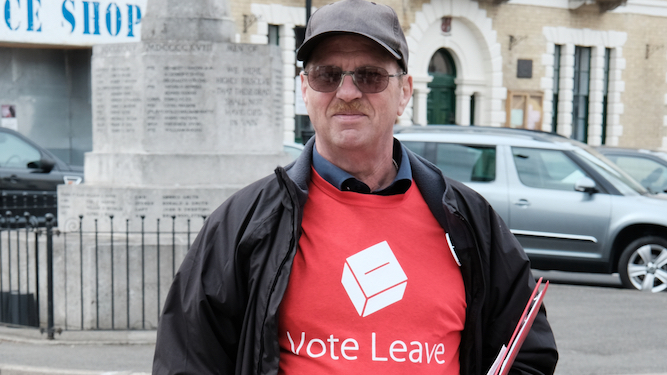 Cheer yourself up by remembering halcyon days of 2016 when you could go to a Leave rally and cheer and wear a red Brexit t-shirt without a care in the world! It felt like those days would go on forever, until it all started going wrong the next day. Popular among elderly relatives who realise they’ve fucked up. You couldn’t have known Brexit was going to turn into a horrible mess, what with having no access to TV, computers, newspapers, radio, magazines, other human beings, etc.